Minimal synth has been getting an awful lot of press these days, and it’s rather refreshing to see. The latest efforts by Led Er Est and Xeno and Oaklander are eating up the blogosphere, while both Wierd Records and Minimal Wave have been thriving with a series of new releases. Up next, via Wierd Records is the Cold Waves and Minimal Electronics compilation, which will be released on Angular Records on February 22nd. The compilation is a perfect starting point for new enthusiasts, and includes classic tracks by The Neon Judgement, End of Data, Absolute Body Control, and many more. Additionally, Pieter Schoolwerth has chosen ten of his very favorite releases for Dusted Magazine Online, records which essentially sparked the creation of Wierd Records. Peep it here. Also, Veronika Vasicka has just curated an equally excellent compilation entitled Minimal Wave Tapes Vol. 1, which collects several of the classic releases reissued by Veronica’s label, including tracks by Ohama, Tara Cross, Das Ding, and many more. You can pick up a copy here, and view Veronica’s top 20 minimal wave recordings here. This one is a melancholy minimal synth track with female vocals. It’s dark and mysterious, and pretty much sounds like what the cover looks like. The bassline is simple and solid, and the melodies create a nice atmospheric mood for the vocals, “You don’t know my name (but I know you)”. It’s a sad love song about loneliness and obsession. There’s a 120bpm TR808 kick drum through out the track, and never a snare or hi hat. That sparse rhythm section creates a nice build-up of tension. Expect more goodies to come, but don’t forget to support both of these incredible labels as often as possible! This entry was posted on January 26, 2010 at 2:52 am and is filed under 1980s, kym amps, minimal, minimal synth, wierd records, xeno and oaklander . You can follow any responses to this entry through the RSS 2.0 feed You can leave a response, or trackback from your own site. What's the release year on this? I've never been able to find out. Any idea? Hello from Australia! Thanks a lot for posting such great minimal synth this year. I know its a lot to ask, but is it possible for you to please upload this post again with another provider besides zshare? Hello, you posted the upload link, I believe that you meant to post the direct link: http://www.zshare.net/download/71698026cfe96189/? BTW, thanks for your work on this blog! I came across it recently and found so much really good stuff that I would have likely never known about otherwise. Thanks!!! Awesome tracks! Thanks for sharing! 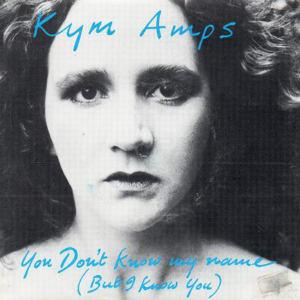 Vanilla Face: Kym Amps tells me via Facebook that the 7" was recorded back in 1980. David Watts is the composer. She wasn't aware that it had been released at all until this year!